tapping our creativity and having some fun with drawing. 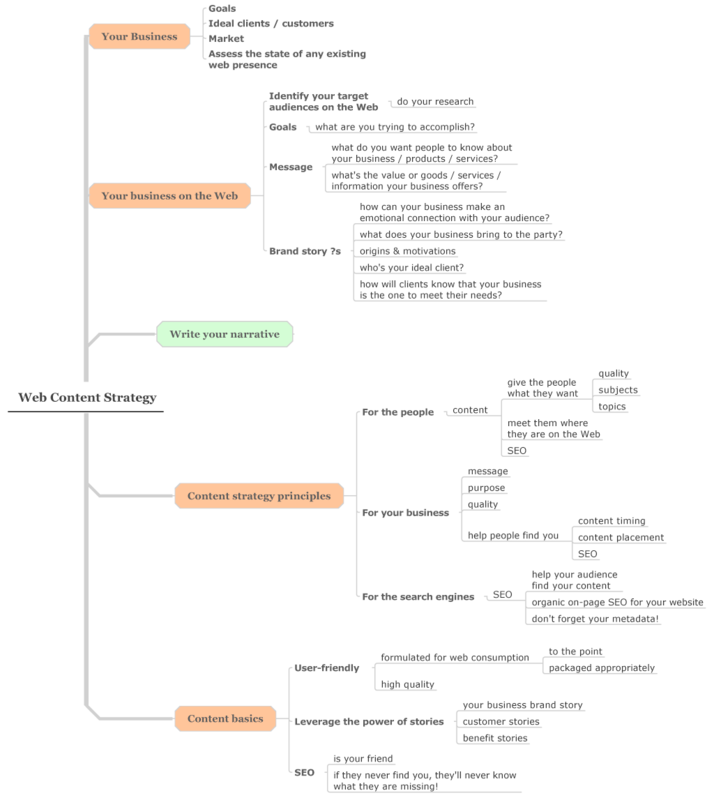 If you’re an entrepreneur or small business owner, mapping your personal web content boundaries gives you a head start on your business web content strategy. Since you’ve already given a good deal of thought to your target audiences, useful web properties, and their business purpose, it’s not difficult to adapt the process to meet other business’ needs as well. Whether you’re writing your own website content, blogging or using other social media and social networking sites to grow your business, a content strategy will improve your results. When it comes to strategy, I prefer to work with a mind map so that I can position issues and topics in relation to one another and the project as a whole. You can also visualize your strategy using Post-it notes, free-form drawings, or any other method that you prefer. Developing a vision of what you want your business to be on the Web takes work, but it’s worth the effort. Taking action to bring that vision into reality starts with your content strategy. existing web presence (if any). Next, expand your focus and consider what you learned when mapping your web content boundaries in Phases 1-3. 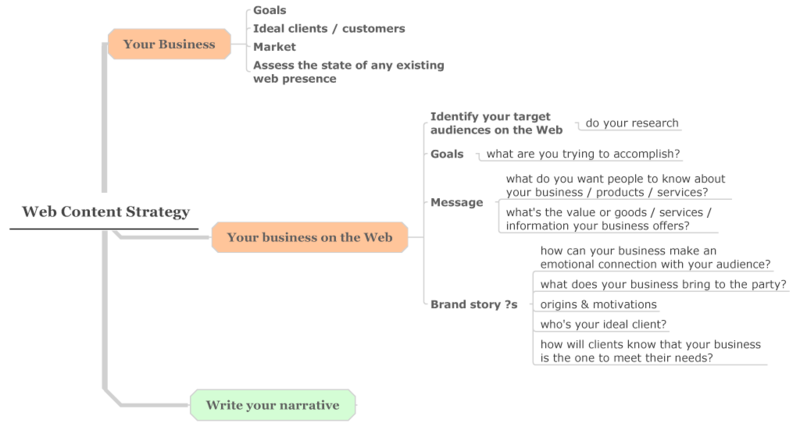 Once you have some clarity about your business and your business on the Web, use your map to guide you and capture the results in narrative form. Just sit down and write it out. Write about how you understand it all from your perspective—write in first person. You’re not writing for public consumption, you’re using the writing process to bring it all back to you and develop your personal standpoint. Your business knowledge and your experience developing your own personal web content boundaries will serve you well when it’s time to envision a content strategy for your business. If you’re worried about ‘giving away the farm’ remember that you can set boundaries for your business blog in a way that works for you and your audience. search engines—so that people can find your content and connect with your business. There’s no doubt that the Web can help you grow your business as long as you recognize that your web content is what people will respond to most of all. The days of talking about ‘brand’ in terms of logos and advertising have faded away. On the Web people judge your business brand by what you do, say, and share—on your business website and on other web properties. Have a strategy and make it count.